Head coach Tom Herman and the Texas football team are headed to the Big 12 championship game after the Longhorns held off Kansas, 24-17, Friday in Lawrence, Kan. (photo courtesy of texassports.com). LAWRENCE, Kansas — Friday's 24-17 win by No. 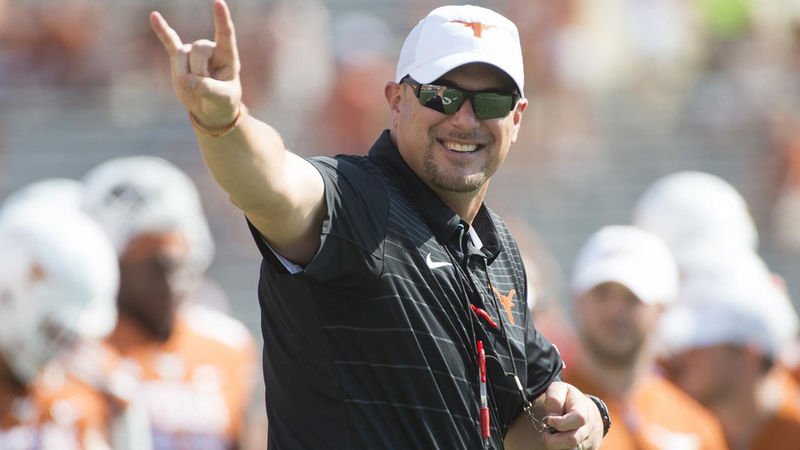 14 Texas over a feisty Kansas team with nothing to lose will not be a game that the Longhorns will want to place in a time capsule, but as a means to an end, it will rank high when the coaching tenure of Tom Herman is examined in future years. UT quarterback Sam Ehlinger wasn’t at his best, but shrugged off the effects of a lingering shoulder injury to throw for two touchdowns and run for another score to help the Longhorns to the victory, played before a chilled crowd of 15,219 at Booth Memorial Stadium in Lawrence, Kansas. The win granted the Longhorns (9-3 overall, 7-2 in Big 12 play) a spot in the conference championship game, it’s first since 2009. Texas will play the winner of Friday night’s game between No. 6 Oklahoma and No. 14 West Virginia Dec. 1 at AT&T Stadium in Arlington, Texas. Through three quarters, Texas shut out a Kansas offense that scored 40 against Oklahoma last week. The 17-point, fourth-quarter comeback by the Jayhawks was a product of the absence of two key defensive players: linebacker Gary Johnson, who was suspended for the game because of a violation of team rules, and safety Brandon Jones, who was knocked out, literally, in the second quarter with a head injury. It was the ninth time in 12 contests this season that the game has been decided by seven or fewer points, a program record. Ehlinger hit on 16 of his 28 passes for 154 yards and two interceptions, and running back Tre Watson ran for 79 yards on 14 carries in the victory for the Longhorns, who avenged a heart-wrenching loss to Kansas in 2016. The loss ended the three-year coaching tenure in Kansas (3-9 overall, 1-8 in Big 12 play) for David Beaty, who was fired earlier this month but was allowed to finish out the season. Former LSU and Oklahoma State coach Les Miles already has been hired to replace Beaty. Kansas quarterback Peyton Bender passed for 159 yards and a touchdown for the Jayhawks while KU running back Pooka Williams ran for 103 yards on 16 carries. “Texas did what it had to do to win the game when the game was on the line,” Beaty said after the game. Texas showed early on that it came to town with a purpose when it moved 98 yards in 11 plays to a 26-yard touchdown strike from Ehlinger to wide receiver Collin Johnson and a 7-0 lead at the 8:08 mark of the first quarter. It was the longest Texas touchdown drive of the season, by yardage. That was all the Longhorns could muster offensively in the first half, despite the fact that they outgained Kansas, 158-82, in the first 30 minutes. One UT drive was halted when Ehlinger, who was not accurate, threw his first interception in 309 passes at the KU 12 when trying to force a throw into wideout Lil’Jordan Humphrey. The Longhorns expanded their lead on their second possession of the third quarter, as Ehlinger hit tight end Andrew Beck in the right flat for a 5-yard touchdown pass at the end of a six-play, 52-yard drive and a 14-0 advantage. The key play on the drive was a 31-yard run by Watson on the snap prior to the scoring play. Ehlinger’s 3-yard touchdown run with 1:02 remaining in the third quarter culminated a 10-play, 60-yard march and pushed the Longhorns’ lead to 21-0. Williams, KU's star freshman running back, who ran for 252 yards on just 15 carries Nov. 17 against Oklahoma, finally got loose on the second play of the fourth quarter, bouncing off the pile before finding clear air off left tackle for a 57-yard touchdown run that brought the Jayhawks back to within 21-7. It was Williams’ fourth run of 50 or more yards for the season, which leads the Big 12. Ehlinger’s second interception of the game occurred on the Longhorns’ ensuing drive when Shakial Taylor stepped in front of a pass at the UT 25 and returned it to the 22. But Texas linebacker Jeffrey McCulloch rescued the Longhorns, jumping to tip a pass from Bender up in the air before intercepting it at the UT 10 and returning it 65 yards to the Kansas 25. The exchange of interceptions produced a 34-yard field goal by Cameron Dicker that expanded Texas’ lead to 24-7 with 10:57 to play. Kansas found some swagger late when it added a touchdown with 3:27 to play on a 31-yard pass from Bender to Daylon Charlot. After a successful onside kick, the Jayhawks made it a one-score game with a 45-yard field goal by Gabriel Rui with 1:37 remaining. Texas then pounced on KU's second onside kick try, and closed out the game in the victory formation. “It feels great to win this game,” Texas defensive end Charles Omenihu said. “I expected Kansas to come out hard, they love Coach Beaty — he’s good people — and these guys have played everybody hard. The Longhorns have previously played in the Big 12 championship game five times, winning three times, most recently a 13-12 victory over Nebraska in 2009 in Arlington. UT's other wins in the game were in 1996 against Nebraska and in 2005 against Colorado, two teams that no longer are members of the conference.